In each of these three classic Epiphanies, he reveals who he is. This week, he reveals himself as the Lover. We will not tarry on this reading, except to say that it gets us started with the idea of God’s love for us, a love compared to the love of a Bridegroom. We see, too, God’s love for the land itself. I have been learning recently about the Song of Songs. There is a strong argument that there, too, the bride is no human woman, but the land of Israel itself. This helps makes sense of strange lines such as, “Thy teeth are like a flock of ewes” (Songs 6:6). It’s not just a bizarre metaphor. The Song of Songs is a love song of God for the nation as a whole – even the land where they dwell. He comes to the wedding. Jesus wants to be where his people are. He is not there to manifest himself – in fact, when Mary asks for a miracle, his first response his reluctance. He is there to be with the people he loves. He has a mother, and follows her. Jesus loves the couple, but he loves his mother, too. The whole story is rich with presence, simply being with the people he loves. He brings wine to the wedding. It’s nothing important, nothing salvific. It’s just kindness to the people he loves. 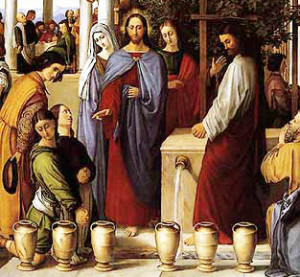 The gratuity of Cana marks love – just as the celebratory aspect of a wedding marks nothing but the goodness of love. It is as if she responds to Jesus’s question with another question, or as if she says to him, “I don’t know, you tell me.” The ball’s in your court, Jesus. Does the lack of wine matter to you? Should it matter to me? I will do nothing but submit to your judgment: you act, and I will follow. And he acts, with bravado. He chooses the water jugs for purification, so it is clear they are pure water. He has the servants fill them, so there are witnesses. He makes the wine excellent. There’s so much to tell about this story, and yet it comes down to one thing: he loves us very much. Cana is a celebration of that love. But his love is not really about wine – anymore than the couple’s love was really about the wine. The wine is just a manifestation, an epiphany, of that love. So our reading from First Corinthians 12 shows us the real gifts of the Bridegroom: wisdom, knowledge, faith, healing, might deeds, prophecy, discernment of spirits, tongues, the interpretation of tongues. The real gift is not the wine, but the Spirit. And it is a gift, again, that leave us not merely as individuals, but drawn together into the Body of Christ – just as in Isaiah, the Lord’s love created a land for them, a nation, and just as at Cana he built up a marriage and a community of friends. God loves us, and gives us love. What would change for you today if you really believed God loves us? This was a lovely set of insights. May I add that the section you for whatever did hot comment on had a wonderful sense which I am sure you are aware of but I cannot forbear pointing it out. Any reference to Jesus is in some way a reference to us since he adopted and accepted our human nature and as the True Adam, He walks in those footsteps. What I mean is that when he is spoken of as the Beloved, then so are we. When he brings His divinity to our humanity, we are gifted to bring our humanity in Him to His divinity insofar as we are capable of receiving such a gift. Instead of being like the first Adam and striving to be God on our own, we are in the plan of God the be divinized through the Incarnation of Jesus of Nazerath. Absolutely mind and heart bongled. It will take a long time for all this to filter into Christians because it is not taught although it has been written about or else I would not know or understand it. Thank you for the opportunity to say and I hope I am correct ih what I am saying if not please correct me with my gratitude.